The much-awaited sequel to the Popoy and Basha love story is finally happening as Star Cinema answers the request of the fans to make a continuation to one of the most-loved movie characters in recent Philippine cinematic history. John Lloyd Cruz and Bea Alonzo reprises their respective roles as Popoy and Basha, to give moviegoers and fans of the film a second look at what happened after the events during the first movie "One More Chance." "A Second Chance" movie, will take us to the married life of now a couple, Popoy and Basha, the things that are happening to them to their chosen life and path, and the what lies ahead of them in the future. In the movie, "A Second Chance", will see a different Popoy and Basha --- apart from their being hopelessly romantic and full of love imagery. Moreover, the movie "A Second Chance" also offers a different John Lloyd Cruz and Bea Alonzo playing the roles of husband and wife. Their respective roles is said to require much maturity and wisdom. "A Second Chance" is helmed by blockbuster movie director, Ms. Cathy Garcia-Molina and is slated for a November 25, 2015 showing. 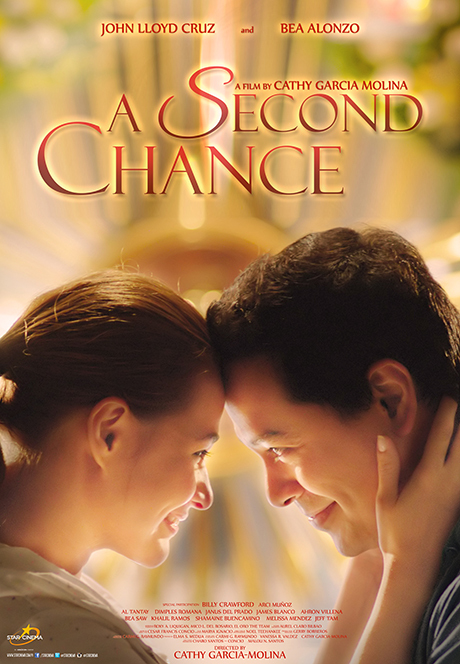 Watch "A Second Chance" full movie trailer below starring John Lloyd Cruz and Bea Alonzo. Enjoy and cry a river!